They say that dog is man’s best friend and at the new Buddy Slots Casino you will certainly be kept company by a friendly looking canine. As the casino’s name suggests there is a huge emphasis on slots and you will find titles from developers such as Microgaming, Net Entertainment, NextGen Gaming, ELK Studios and more. There are a huge range of slots to enjoy built on all kinds of themes. However, in addition to slots you can also enjoy a range of card and table games, video poker titles, arcade games and more. As a result, there is enough to keep the vast majority of players happy. 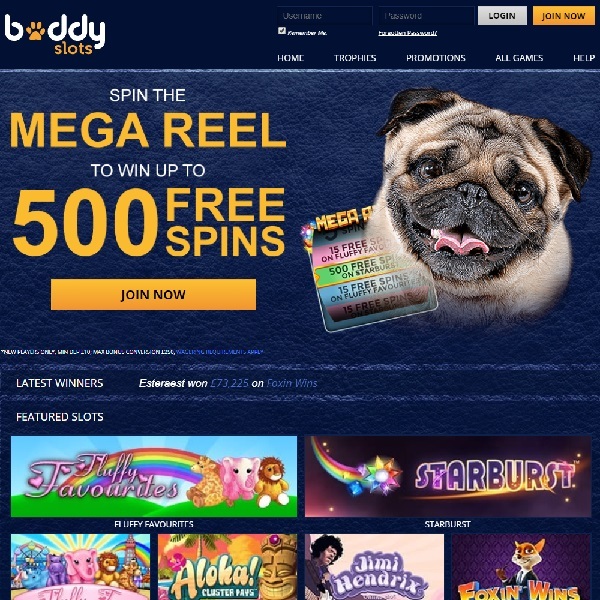 New members of Buddy Slots Casino are given up to 500 free slot spins when they make a first deposit of £10. There are then a number of other bonuses to enjoy. The casino has been licensed in Alderney and the United Kingdom and offers customer support via email, live chat and WhatsApp.